Planning for a comfortable retirement takes foresight, a lifetime of saving money and little familial luck. But planning for love? That might cost you. As a widow, Goldie Linder, 92, lives in her own studio apartment, a choice that honors her desire for independence and is affordable with subsidized rent. She admits she feels lonely sometimes, but love stories from the library keep her company. Leon Zerolnick, 93, (above, right) moved into a well-appointed senior home in Wayne, N.J., last summer. Within weeks he found a real life love story with Ellie Green, 86 (left). The two have been inseparable ever since. Making Decisions: Live Alone or in a Home? Whether or not you age actively and happily often comes down to where you live, and that's based on a matrix of financial, physical and emotional decisions. And while you can't control whether or not you find love, spending more -- sometimes a lot more -- to move into a socially stimulating senior-living environment could be the difference between aging gracefully alone or finding a new partner for the final years of life. The financial issues are significant: The median national cost for assisted living is almost $40,000 a year, while home care -- a far smaller financial drain -- costs an average of $18 an hour in addition to one's regular housing costs, according to a 2011 survey by Genworth Financial (GWF). Single-occupancy rooms at a nursing home cost more than $77,000 a year. Other cost comparisons found at Caregiverslist.com price assisted living at $4,000 a month to start, with home care options ranging from $15 to $25 per hour. But even tougher are the emotional issues that no one wants to talk about, like serious illness, dying and death. Elder-care experts agree that too often, care decisions are typically left until there is an emergency, such as debilitating fall or other medical emergency. "The majority of American families will face [the need for long-term services], but no one wants to talk about it," says Larry Minnix, president of nonprofit advocacy group LeadingAge. The age wave that began this year -- 8,000 people a day are turning 65 in the United States, according to Census Bureau data -- means that more seniors and their families are starting that conversation. By looking at the generation ahead of them -- the Leons and the Goldies -- they get a glimpse of the costs and benefits of different senior lifestyle decisions. In Leon's case, he and his family had to make a snap decision after a terrible fire last July destroyed the condominium where the widower had lived independently. It was necessary to clear both the emotional and financial hurdles before Leon's move to the Emeritus senior living home, his daughter Elaine Schlossberg says. But for him, finding companionship has made the change worth it. If the stigma of a group senior home is that care is too institutionalized and expensive, the knock on living independently is that it's too isolating. Goldie's family helped her to find a subsidized apartment that satisfied her need for independence while offering enough social outlets, like a nearby senior center, to keep her occupied. Her home caregiver, Ida, 83 herself, comes five times a week to help with chores. Yet for many families, it is ultimately the physical condition of a senior that makes either assisted living or independent living impractical. And the alternative -- a nursing home -- often doesn't have the right feel or price tag, leaving much of the caregiving to family members and hired aides. The AARP estimates that in 2009, 42.1 million family caregivers provided elder care every day. The value of their unpaid work: $450 billion. Ellen Loewy, 55, and her husband are taking care of her 84-year-old father in their home in Hicksville, N.Y. Her father's fading memory -- and her close relationship with him -- made home care the only option she'd consider, says Ellen, although she admits a break would be nice. Respite comes from a local caregiver franchise. Ellen says the costs for hiring a home caregiver are around $2,500 to $3,000 a month for her father. Currently, she's trying to match her schedule with his caregivers so she and her husband can take a weeklong vacation in December. Managing schedules and caregivers -- and paying the associated bills -- is like managing a small corporation, says Terri Corcoran, 60, who lives with her aging, bed-bound husband, in Falls Church, Va.
She says last year she spent $78,000 on home care alone, and finding the right aides has been an ordeal. No-shows, bad personal hygiene, and poor personality fits with caregivers been a challenge for Terri, and she says it has taken several years to find any consistency. But despite it all, Terry says she would never send him to a nursing home. "We have a nursing home in our backyard and it's more expensive," she says, "He can't speak for himself at all and he wouldn't get the attention [he needs]. A lot of people I know hire [additional home care] aides to go to the nursing home." Lee Refzam, 79, has been on both sides of the debate: Until this year, she lived independently in an apartment in Raleigh, N.C. After she took a tumble that compromised her mobility, she had to face up to the reality that she needed help. Her daughter, Jayne, lobbied for Lee to move to Seattle, where she lived, and into a senior living home. Lee recalls being hesitant to lose her independence, move to a new a city and leave her old life behind. 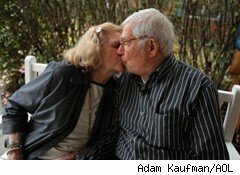 But five days after arriving she met Doug, 74, and within a few months, they got married. And they are not the only ones. Lee's voice lights up when she talks about all the new couples that have formed at the senior living home. "We have become a close knit family, and some of them have gotten married," she says. "None of them will ever have a baby!"